My response to Daniel was that I’d get back to this topic in a separate post, which pretty much brings us here. And this is also where we get into something of a philosophical domain that is, of course, not just limited to how Paolo Rivera draws the radar sense, but how it’s been done historically as well. However, while we’re on the topic, I realized that there are a couple of properties of the radar sense that I’ve never really touched on despite the fact that they are pretty central to the understanding of Matt’s “vision,” and despite the number of posts I’ve specifically devoted to the radar sense on this site already. For this, I also wanted to use a couple of panels from the current run on Daredevil, but I’ll return to that in the second half of this post. Getting back on track (before I have everyone so confused that you guys are ready to head over to some other comics blog where things make sense), let’s look at Daniel’s comment quoted above. 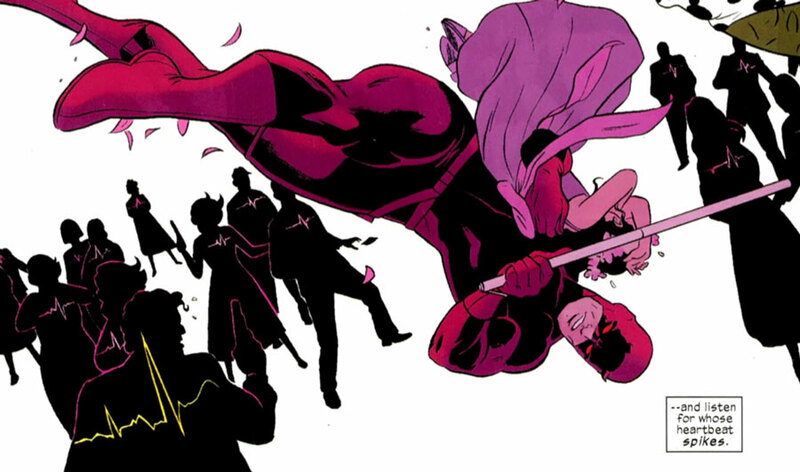 And, just so we’re all on the same page, below is the panel he’s referring to, from Daredevil #10. The question we need to ask ourselves here is what purpose the radar panel of Mole Man’s face serves in this story, and what it really says about Daredevil. I’d say that its main purpose is to remind the reader that Matt’s perspective is different from that of the average person; that his way of “seeing” is unlike our way of seeing. Whenever a non-radar panel is used in the comic, that represents the viewpoint of the majority (whether we’re talking about the reader or the average Marvel Universe inhabitant). When a radar panel is used, it reminds the reader of this other way of seeing, but it can’t fully recreate it in a way that perfectly mimics the real deal. The topographic wireframe rendition that Paolo Rivera introduced is a great model, but it’s really just that: a model. What can be done on the page is not only limited by the fact that the artist is trying to transfer a three-dimensional, yet colorless, image to the two-dimensional page, but also by what the reader is able to comprehend. While the “silhouette interpretation” of the radar (see Frank Miller and others) has been much more common, Rivera is not the first Daredevil artist to attempt something a little more three-dimensional. Another example is Scott McDaniel, who provided the art seen in the panel below, from Daredevil #306 (Vol 1), written by D. G. Chichester. His approach is different from Rivera’s wireframe, but seems to try to capture some of the same aspects of the radar image. The only problem with it that it’s quite difficult to figure out what Matt is “seeing” in these instances. I happen to like the exotic nature of McDaniel’s radar. The fact that it makes the reader work a little harder is a good way of underscoring the difference between Daredevil’s impressions and everyone else’s. However, Rivera’s wireframe is probably the better compromise. 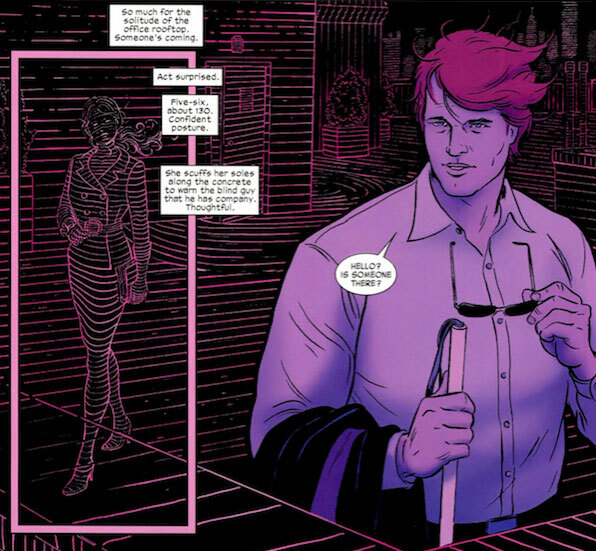 His radar images are clear enough to allow the reader to understand what Daredevil is seeing, while at the same time capturing the colorless and “depth-based” properties of the radar. This allows us to understand where the main differences between the two perspectives lie without slowing down the story. However, if we require that readers be able to understand what it is Daredevil is looking at, that also means that Mole Man’s face (in this instance) be drawn in a way that makes him recognizable to us readers. 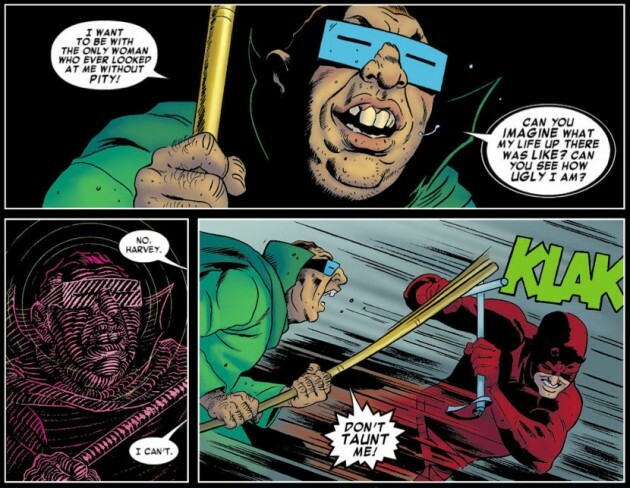 My take on all of this is that in trying to balance the demands of drawing the radar as different with the need to create a recognizable image, the art may actually be exaggerating Daredevil’s ability to recognize both faces and certain other objects. Matt may not be lying at all when he tells Mole Man that he’s unable to see his face. However, the Mole Man panel highlights a conflict between the art and writing that has popped up from time to time for the book’s nearly five decades of publication. My main reasons for arguing that Matt Murdock would have a problem with faces really stem from two sources. The first one is the writing, as handled by Mark Waid currently, and also by past writers. Looking only at what is said about the radar sense and what is expressed by the main character, without bringing the art into the picture, it is clear that the notion that Matt can’t see faces (at least not well enough to use as a basis for recognizing people) is much more widespread than the notion that he can. Even the most obvious of facial expressions, such as a smile, is more often referred to as something that can be heard, or otherwise inferred, than “seen” by means of the radar sense. Looking at what Mark Waid has had to say on the topic, it’s pretty clear that he imagines the finer details of the human face to be beyond Matt’s grasp. Aside from what writers have had to say on the subject, it is also a well-known observation that being able to recognize faces is one of the first things to go when someone’s sight deteriorates. People whose vision is at or even below the 20/200 mark (the legal blindless limit, and the equivalent of having only one tenth of normal visual acuity) commonly have no problems with mobility and don’t need to use a white cane. Facial recognition, on the other hand, is an ability that starts to drop off as early as around the 20/30 – 20/40 mark. This is not surprising considering the number of people who have fully correctable vision but will attest to failing to recognize people when not wearing their glasses. If you consider how much the color of people’s eyes, skin, lips, hair, eyebrows etc help in recognizing people, that’s obviously another disadvantage that Matt would have. With Daniel’s comment dealt with to the best of my ability, I thought I’d take the opportunity to address a couple of other radar-related things that might provide some food for thought, the first being whether the three-dimensional take on the radar makes more sense than the silhouettes that have been a common artist’s choice historically. I would argue that both are equally valid, but at different ranges. I’ll get to why below this beautiful panel from Daredevil #1 (Vol 3), that actually shows Paolo Rivera drawing people as silhouettes (in order to emphasize their heart beats, I suspect). Historically, the above take on the radar sense has been much more common, and is also seen in at least one scene from Marcos Martín’s issues. For close-ups, the wireframe approach which reveals more depth and follows the contours of objects more closely makes more sense to me given that whatever the radar sense really is, it relies on the relative distances between Daredevil and various points in space around him. This is key to understanding one of the main differences between normal vision and the radar sense: The first creates depth from two flat images (one presented to each eye), the other creates an image – or understanding, rather – from only relative depths. However, at greater distances, the “shadow” cast by the reflection of some signal (sound, or something else) should appear relatively flatter. Think about it this way: If you take a large object, like a car, and imagine that you’re standing right in front of if (say 5 ft away), then the windshield will be approximately twice as far away from you as the bumper, making the relative distances of the two parts of the car large. The farther away from you the car is, however, the smaller the relative distance between the windshield and the bumper compared to the distance between yourself and either surface. If you’re relying on sound (whether ambient of self-produced), or some other kind of energy with a frequency pattern to it, you will eventually reach the point where you can’t resolve the difference between the signal that bounces back from the windshield and the one that bounces back from the bumper and your overall impression of the object will be dominated by the “silhouette” given by its two-dimensional form. This name of this blog is a play on the title of Brian Bendis’s and Alex Maleev’s last story arc on Daredevil: The Murdock Papers. I think most people would agree that that arc was not Bendis’s best work on the title (for one, it had Elektra confessing to helping the Kingpin gather documents that didn’t actually exist…). It also introduced the questionable notion that S.H.I.E.L.D. has information about the range of Daredevil’s radar sense. I’m mentioning it here, however, because while I may have disagreed with much of what Bendis did in the senses department, there’s definitely a great deal of logic to the radar having a finite range. Again, this assumption holds regardless of what we imagine the radar to be. I mentioned above that one big difference between the radar perspective and normal vision is how the former constructs image from depths while the latter constructs depth from images. Another key difference is the “light source” factor. Those of us who can see light rarely have to bring our own light source to the party. With indoor lighting and, more importantly for greater distances, that big yellow disk up in the sky that makes sure everything we need to see is clearly illuminated, we can see as far as we need to. Literally for miles. The Daredevil experience is more like walking into a pitch black cave with a 360 degree headlight on your head. How far you can see depends on the intensity of the signal, of course. However, it’s not infinite. The inverse square law dictates that the intensity of an electromagnetic signal (such as light or radiowaves) emanating in all directions from a point source diminishes by a factor of four for each doubling of the distance from the source. If we’re talking about sound, the law dictates that the intensity is halved with each doubling of the distance from the source. So, whether Daredevil’s head actually emits some kind of sound or radiowave, the signal will die off pretty quickly. The situation is obviously similar if he relies on ambient sound (my own favorite interpretation). This actually matches what we’ve seen in the daredevil comic pretty well, with many writers emphasizing that the radar allows Daredevil to get an idea of his immediate surroundings. The interpretation of “immediate” probably varies quite a bit by writer though. Either way, at greater distances, things won’t just appear flatter, but fainter as well. Eventually, no signal will bounce back and anything at the far end of the range will disappear into a void. For this reason, I’m a much bigger fan of how the “far away” is handled in the panel below on the left (nothing is bounced back from the “far away” position beyond the shooter) than the one on the right (where even distant skyscrapers are visible). Both are from Daredevil #1. So, there’s one more geek-out for you, all thanks to Daniel and his comment. So, thanks Daniel (and Paolo Rivera, of course) for inspiring this post! Great post, Christine! As I’ve mentioned before, your blog was my primary source for researching just how the radar sense has worked in the hands of other creators. When I first started, I thought it was straight echolocation, which had always bothered me because the concentric rings drawn around Daredevil’s head imply that he is the source of energy. Also, I’m glad you singled out the skyline panel. I really wrestled with that one for exactly the reasons you mentioned. In the end, I figure I have tons of leeway for artistic license, with story trumping physics. In subsequent issues, I’ve tried to keep the radar panels focused on the immediate vicinity (with a few exceptions). The one thing I will say: no one has mentioned that DD can “see” Mole Man’s own radar vision in that panel, though it’s faint (and in a different color). I decided to draw that at the last minute, and no one seemed to mind. I never even thought about that! 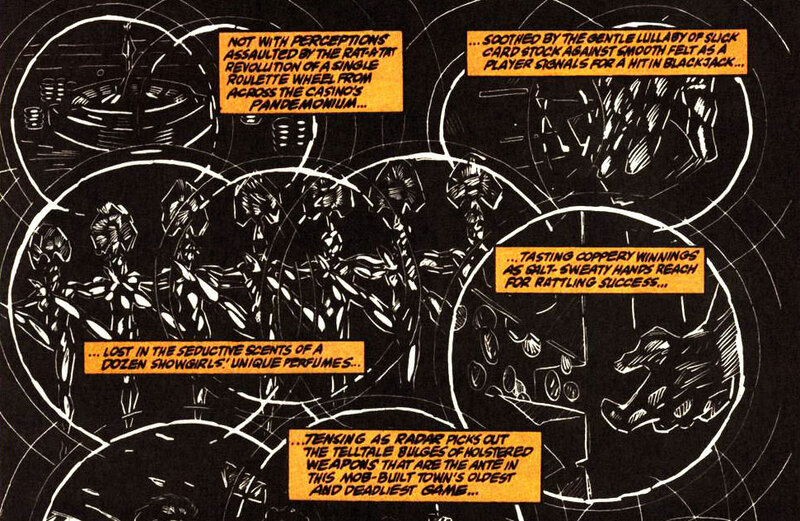 Probably because something similar has been done by other artists when they’ve drawn the radar, in which case the rings around the object have always been Daredevil’s. Interesting. I will probably always be partial to the radar being straight echolocation, but that’s just a personal preference and I care much more about it just being handled somewhat consistently (with room for artistic license on behalf of both artists and writers). You guys are giving so much attention to Daredevil’s perspective, that I have very little to say except to encourage you to keep up the good work! And, thanks for commenting. I like the closer is clearer concept except that when he jumps off buildings presumably he has far enough of a sense to know what there is to catch onto or bounce off of before he jumps. The “good thing I can’t see what I’m doing” concept works well enough to a point, but one hopes that he isn’t jumping off the building with the stray hope that he might pick up the sense of a flagpole or power-line somewhere on the way down. He might be a bit on the edge, but he’s not suicidal. (At least not most of the time we hope.) Hmn… which brings my thoughts back to your previous “new technology and its affects on how he moves through the world” article. The recent trend of burying cables would be decreasing his ability to move from building to building. The distance appearing visually flatter comment reminded me of when I visited the Grand Canyon and noticed that I wasn’t scared of looking down from the edge because it was so deep that it didn’t look real. Strange to think that he wouldn’t be able to “see” it to the bottom. Wow. What a great post and what a great answer to my original comment! Thank you. Reading that scene makes much more sense to me now. I agree that Matt was neither lying to or taunting Mole Man in this situation. His radar may be seen mapping the contours of Mole Man’s face, but the information fed back to Matt’s brain would probably just translate as the sense that someone or something was in front of him, not the finer details of Mole Man’s features. The artist differences in the interpretaion of the radar certainly do play a big part in understanding this scene. By this I mean, if Chris Samnee had drawn this issue, having seen his interpretaion of the radar (3D silhouettes), it would have been slightly clearer that Matt really couldn’t tell how ugly Mole Man was. Although, I actually do prefer Paolo Rivera’s renditions of the radar (the 3D wireframe) to anyone else’s seen thus far. That said, I think that from now on, whenever I read a panel detailing the radar sense, i’ll try to keep in mind that the image that we, the readers, are presented with is not exactly what Matt “sees”. Very interesting! I like this interpretation. In response to Elizabeth’s comment, I’d like to point out that if we do assume echolocation is a big part of how the radar works, the fact that sound moves differently through different media would tend to affect his range. I’ve had relatively sensitive hearing for most of my life, and I know from experience that a city street, with all that concrete and steel around, can be like an echo chamber, especially from above. From high up, I can often hear conversations at street level, even though I can’t necessarily hear roof-level conversations from the street. Presumably this would affect the acuity of Matt’s radar when he’s leaning over a railing and “looking” for flagpoles. Finally, Christine, kudos on the faces observation! You’re quite correct that faces are one of the hardest things to recognize with impaired vision. I had flashbacks to being 15 years old and playing P.E. soccer without my glasses. (I wasn’t allowed to wear them for sports because I couldn’t afford to replace them if they broke.) With so many similar-sized girls wearing identical uniforms, I had real trouble distinguishing between my teammates and my opponents unless I was looking at the lone redhead. RM – You and I had similar experiences at around the same age. I broke one of the lenses in my glasses Freshman year in high school. Since I found wearing one lens was very annoying, I had to do without for a few weeks until they could be replaced. (No Hour Eyes available back then.) Being very nearsighted I found I couldn’t see faces either, but could recognize my friends at a distance by the general color of their skin and hair and how they moved. (I wasn’t always right, but often enough to surprise me.) Thankfully I wasn’t in any sports at the time. It’s interesting what you learn when you are thrown into unusual situations. Very interesting, Elizabeth! I didn’t have much luck with skin tones–too similar in a mostly white school–but I could pick out people I knew by voice and movement, and sometimes by smell if we were close friends and I spent a lot of time around them. (This really freaked people out.) I wasn’t officially in sports, either, but I had a physical education teacher who had no sympathy for non-obvious disabilities–which is why the nearly blind fullback ended up working with the crippled goalie. Luckily for me, I’d already been reading Daredevil comics for three years at that point, and had made a hobby of stretching my other senses to their limits. Between my ears, my nose, and the fact that opposing players assumed I knew what I was doing when I charged them, I managed to survive P.E. soccer. my favorite comment from Mr. Murdock that he’s said about his radar sense is that it isn’t just simply a substitute for vision, there is a kind of feeling to it as well. You never acknowledge this in your radar sense spiels. I dont think he doesn’t see the buildings on the far ranges of his radar as flatter or less clear, I think he feels them less, kind of like as if you would compare the feeling on the tips of your fingers to the hard skin on the back of your heel. i agree with Marcus, i think DD’s radar sense isnt something DD can see. It’s something he feels, he feels the sound vibrating off surfaces and is able to move in relation to that sound but theres no sight involved at all. DD truly is blind with no sight whatsoever, the radar simply acts as a substitute for sight. or at least thats how ive always assumed it works. Hello my name is Gus. Im new to this site and I’ve just been amazed with all of the history of Matt murdocks radar sense and I just wish writers could come up with something consistent and interestin.I was thinking since in the very beginning Matts radar was jus something tht helped him avoid things….but yet gave him nothing more then a”tangling sensation” whenever he was close to something….why couldn’t it be a hyper sense of touch or a extension of his sense of touch.I mean even if u can’t see something u kno a great deal about if u were holding it.u could tell if it were soft or hard,if it were something living or not,where it is in relation to your self and more.and this would b more reliable then jus him picking up on the ambient sounds in a given area.even if there were say a loud sound or many sounds at once his sense of sound maybe is thrown off but not a”touch like radar sense”.it would also explain how could he”scan” a building or map a location jus from being on the outside of a building or how he can tell how many people or obstacles are in a location even when its dead silence.perhaps it could be some field that his body makes and once it touchs somethin and goes through it…it can give him info like:someone has a small knife in their pocket,someone has a lighter in pocket,or it can tell him whatever it is its….small and made of metal or something just as one guesses about something while feeling it in the dark wit there hands.even frank miller made it were matt felt like his radar was”touching everything at once”.in physics since all matter gives off its own electrical field….hence were able to touch it…why cant the radar be….he can feel and process the electrical fields surrounding any and all things physcial?I think a radar sense like this(that is based on having a hyper sense of touch/extension of his sense of touch)would be a perfect visual replacement along wit giving him an edge that I believe stan Lee wanted him to have in the first place since he maybe is blind…but yet he can do more then those of us wit sight will ever do.plus I read where you plan on giving your view of what the radar sense really is.do you plan on doing this anytime soon?but I do love the way you have broken down so much of the science of his powers.I love reading about stuff like this. I feel like I should also point out something Matt said in Daredevil #1: “It’s gotten so that words like ‘rectangular’ or ‘yellow’ or even ‘slim’ or ‘fat’ are not the sort of terms I tend to think in anymore.” So maybe he says he can’t see how ugly Mole Man is because, regardless of the extent to which he can recognize faces, he doesn’t think of it as ugly or anything. To him, it’s just a face. This is a great post, Christine! I love how much thought you put into your blog; it’s really fun and thought-provoking. Keep up the good work! I forgot about that.your right Amanda.So does this mean then that not only does he sense things in different ways then us….but also his brain interprets the info itself,sound,touch,taste,smell, and what ever the radar is, differently then us as sighted people interpret these senses? Pingback: #1 With A Bullet: Mark Waid’s Daredevil | read/RANT!